In traditional Hungarian cuisine, goulash is a thick stew made by cattle herders and stockmen and this is where everything else ends. There is no recipe, no ingredients list, only paprikás seems to be the one consistent component in all the recipes I found. 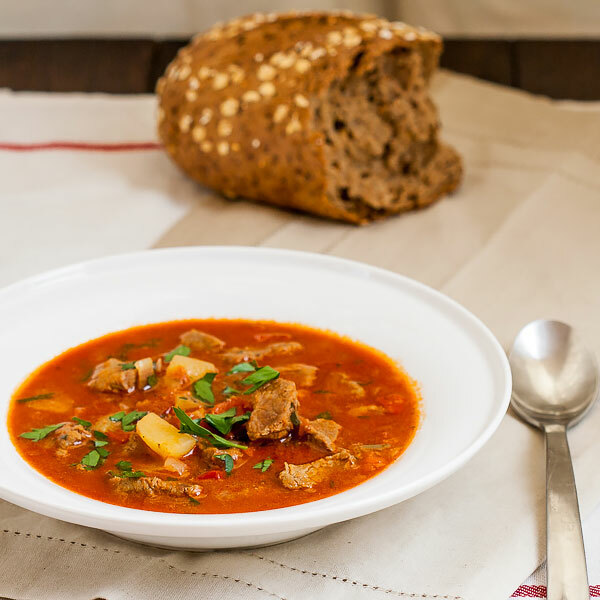 Goulash can be prepared from beef, veal, pork or lamb/mutton… did I miss any other meat; garlic, tomatoes, caraway seeds, bell pepper, wine are totally optional. You can also make it into a soup or a thick stew and add potatoes, pasta, rice… basically anything else you can think of. You might say it’s a mess; even in Hungary there are more than 10 different variations of goulash, nobody knows the exact number I think. However, whatever ingredients you might use, the end result is always delicious… for some reason. lol Anyway, this is how I did mine and I really loved it. Right, for this recipe I used beef-inside round but don’t ask me what that is because I have no idea, that’s what the label said. Take a decent size soup pot thing, add lard or vegetable oil; keep it on medium until it gets hot then throw in your beef, cut in cubes. Mix for a bit then put the lid on and let the meat cook in its own juice until all the water coming from your beef is gone and only the oil/lard remains. At this point try not to let the meat fry too much; add your onion and bell peppers (and your hot red peepers if you went that way) and caramelize everything like a pro. When onion becomes translucent and peppers soften up a bit it is time to add paprika (chilli flakes if you did not use hot peppers) and ground cumin; mix vigorously but don’t burn your spices. When you are satisfied with the result add some water only as much as you need to barely cover your ingredients; if you need more you can add later. This cooking stage will probably last 30 minutes to an hour, depending on the meat you are using. When your meat is almost done/cooked, add potatoes, tomatoes, sugar, salt and pepper to taste. Tomatoes need to be peeled but you can definitely use canned whole tomatoes, that’s what I used and they were great. Let the thing boil for another half an hour or until meat and potatoes are done. The end result would be a thick soup but not as thick as mushroom soup for example. You can definitely cook your soup longer so that it reduces some more or if you’re in a rush, you can mix some flour with tomato juice and add to it but traditionally they don’t use anything else but paprika to thicken the thing… or boil it to death. Now, the moment you turned off the heat you can add parsley, finely chopped and as much as you want; it will totally enhance your soup. Add lard or vegetable oil to a large size soup pot; add beef and cook on medium heat until all water coming from it evaporates. Don't let the meat fry, add onion and peppers and mix until they get properly caramelized; onion will be translucent and pepper will soften quite a bit but not mushy. Add sweet and smoked paprika and ground cumin (and chilli flakes if you went this road) and seriously mix everything; let those spices roast for a bit but don't burn them. Add water but only as much as you need to barely cover your ingredients and let cook for about 30 minutes. Get your tomatoes ready if you are not using whole canned ones. To get the skin of them easily, boil some water and drop them inside for 1-2 minutes or until their skin begins to split. No biggie. When meat is almost done/cooked, add potatoes, tomatoes, sugar, salt and pepper to taste. Cook for another 30 minutes to an hour, or until meat and potatoes are done. Add fresh chopped parsley and enjoy... I definitely did!